Iliotibial band syndome is a common cause of knee pain and hip pain in runners. The most common symptom is pain on the outside of the knee. The repeated bending and straightening of the knee and hip during running however, can cause either area to become inflamed. 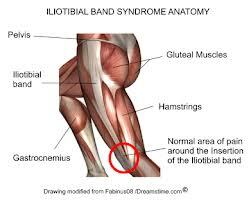 At the knee the insertion of the iliotibial band becomes thickened. At the origin of the tendon tightness in the iliotibial band causes compression of the trocanteric bursa and this in turn can become inflamed. Lie on your side with the roller just below your hip. Bend your upper leg and place that foot on the floor. Roll along the side of the leg between hip and knee. Switch legs. Starting position: Side lying. Underneath arm outstretched in alignment with the trunk with your head resting on this arm. Hips bent up to approx. 45° and knees bent up to approx. 90°. Shoulders and hips stacked. Top hand resting on the floor. Draw the top hip downwards away from the top shoulder to create a small space between your waist and the mat. Rest position with centre engaged: no pillow under head. EXHALE, gently roll your lower back into mat, scoop your tailbone upwards and continue to peel your spine off the mat, bone by bone until you are resting on your shoulder blades, keeping pelvis level. EXHALE, lower the shoulder bridge by lowering one bone at a time to the mat, beginning with the upper back.